Next job (after first draft done) on Simon the Fiddler is to map out Military and Main Plaza plus surrounding areas and fill in where things were in 1869/70. I know where the Vance house was, and the Plaza Hotel, Horde’s Hotel, other bars and saloons. Also Cassiano’s, also Yancey’s Feed and Supply, finally figured out where the old city hall was (they called it the Bat Cave and the jail was in the rear) and I think the wagon yards were down south on Flores street. 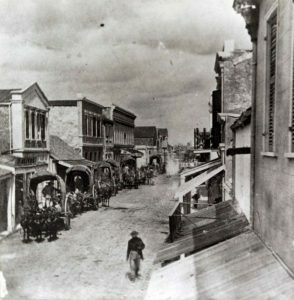 This is Commerce Street looking east from the Plaza, toward the Alamo, 1870. Very helpful. Especially regarding the man’s clothes, the make of those wagons. I think they were freight wagons. Look at the rear wheels, they were huge. Men’s hats at that time, at least in the city, were very short-brimmed. Very few wide-brimmed hats that I can see — why? In that sun?